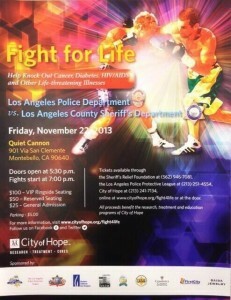 Los Angeles County sheriff’s deputies are squaring off in a boxing ring in Montebello with Los Angeles police officer tonight at 7 p.m. to raise money for the City of Hope in Duarte during the 20th Annual Fight for Life. This entry was posted in LAPD, Los Angeles County Sheriff's Department by Brian Day. Bookmark the permalink.